In a letter to Oregon Senator Ron Wyden, James Clapper, the director of national intelligence, confirmed that the National Security Agency has used a 'loophole' to search the private communications of US Citizens. Many of the NSA's most controversial programs collect information under the law affected by the so-called loophole. These include Prism, which allows the agency to collect data from Google, Apple, Facebook, Yahoo and other tech companies, and the agency's Upstream program – a huge network of internet cable taps. Clapper did not say how many warrantless searches had been performed by the NSA. It was not the first time the searches had been confirmed: after the Snowden leaks, the office of the director of national intelligence declassified documents that discussed the rule change. But Clapper's letter drew greater attention to the issue. I am sure Diane Feinstein will be outraged. Oh, wait. 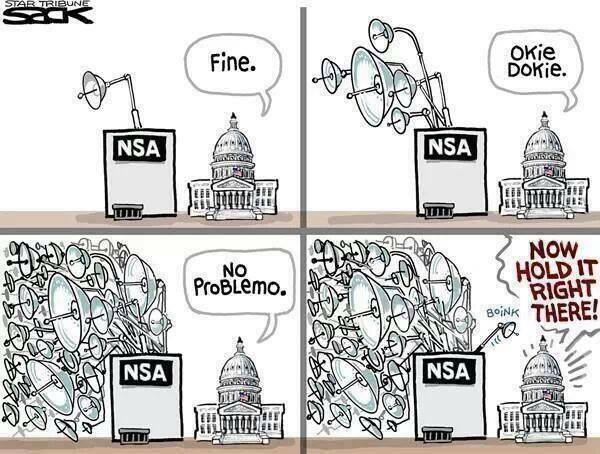 She is only outraged when the NSA is spying on her.